Brussels Sprout 'Groninger' is a second early variety noted for its great tasting sprouts, particularly after the first frost. It produces medium sized green sprouts and gives a steady supply of great tasting sprouts through the autumn and into the winter. Groninger has a wide sowing window, particularly useful if the weather is being a little awkward! It can be sown under glass in February or March (to plant outdoors in April to May) or can be sown directly outdoors in April or May. Harvest October to December – perfect timing for that all important Christmas Dinner! All brassica crops grow best in partial-shade, in firm, fertile, free-draining soil. Start digging over your soil in autumn, removing any stones you find and working in plenty of well-rotted manure or compost. Tread on the soil to remove any air pockets and make the surface very firm. Brassicas will fail if the soil is too acidic so add lime to the soil if necessary, aiming for a pH of 6.5-7.5. Nearly all brassicas should be planted in a seedbed or in modules under glass and then transferred. Sow thinly, as this reduces the amount of future thinning necessary and potential risk from pests. Cover seeds to 1.25cm (¼ to ½ inch) deep and transplant the seedlings when they are about 7cm (3in) tall. Do not allow transplants to become stunted before transplanting. Water the day before moving, and keep well-watered until established. Space plants 60 to 90cm (24 to 36in) apart in the row, or 60cm (24in) in all directions in beds. Brassicas are affected by a wide range of pests and diseases. Make sure the soil is adequately limed and well drained. Rotate your crops annually to avoid disease. Don't grow brassicas on the same plot more often than one year in three, as moving the crop helps avoid the build up of soil pests and diseases. Apply one side-dress application of nitrogen fertilizer when the plants are 30cm (12in) tall and water to keep the crop growing vigorously during the heat of summer. Without ample soil moisture, the crop fails. Insect control is also very important to keep the plants growing vigorously. Cultivate shallowly around the plants to prevent root damage. The sprouts form in the axis of the leaves (the space between the base of the leaf and the stem above it). The old practice of pinching out the growing tip to hasten maturity is often no longer recommended, but you can do so if you wish - about three weeks before harvest, the plants are topped (the growing point removed) to speed the completion of sprout development on the lower-stem area. The small sprouts or buds form heads one to two inches in diameter. They may be picked (or cut) off the stem when they are firm and about one inch in size. The lower sprouts mature first. The lowermost leaves, if they have not been removed already, should be removed when the sprouts are harvested. Harvest sprouts before the leaves yellow when the sprouts are small, compact and bright green. Avoid yellowing sprouts with signs of wilt rot or insect damage. 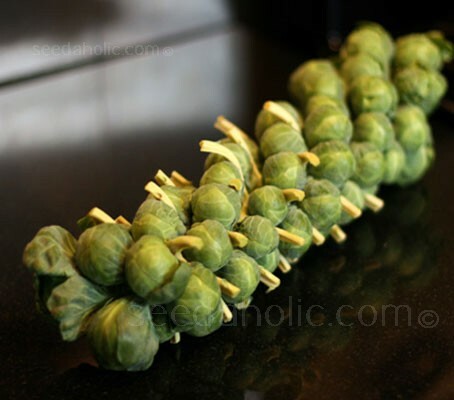 Harvest sprouts when they are no larger than 2.5cm to 4cm (1 to 1½in) in diameter. The key to cooking Brussels sprouts is in not overcooking them. The leaves cook faster than the core, so cut an X in the bottom of the stem. Depending on size, cooking time should not exceed 7 to 10 minutes whether you are steaming, braising or boiling. Select sprouts of even size for uniform cooking. Large sprouts should be cut in half. The best home preservation method for Brussels sprouts is freezing. As with any vegetable, Brussels sprouts will need to be blanched prior to freezing. In the 18th century, selections of cabbage plants which produced a large number of large, tightly packed leafy buds along the main stem were developed in Belgium. These became known as Brussels sprouts and were named Brassica oleracea variety gemmifera, which translates to "garden cabbage bearing gems." The variety "Groninger" is named for a city in the north of the Netherlands. Sow indoors February to March, Sow outdoors in April to May.